In this lesson, we will learn how to calculate the slope of a line given two points that lie on it and find the coordinates of a point on a line where another point and the slope are known. Line 1 passes through point 𝐴 ( − 6 , 1 7 ) and point 𝐵 ( − 1 8 , − 1 4 ) and Line 2 passes through the points 𝐶 ( − 1 2 , 1 8 ) and 𝐷 ( − 9 , 2 0 ) . 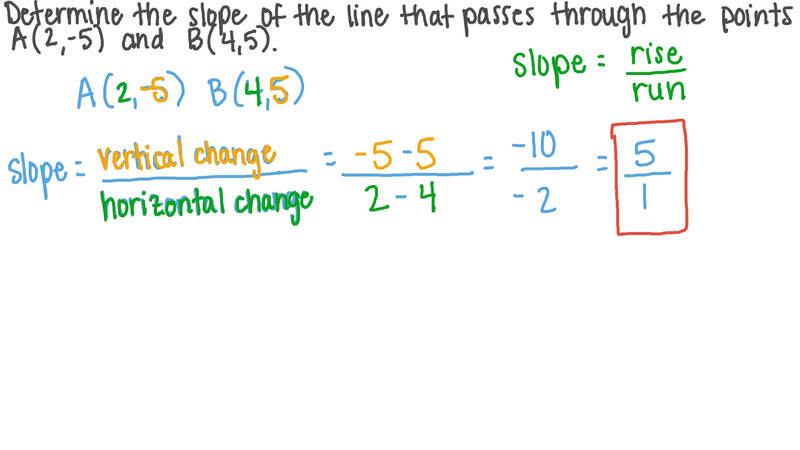 Which of the two lines has a steeper slope? 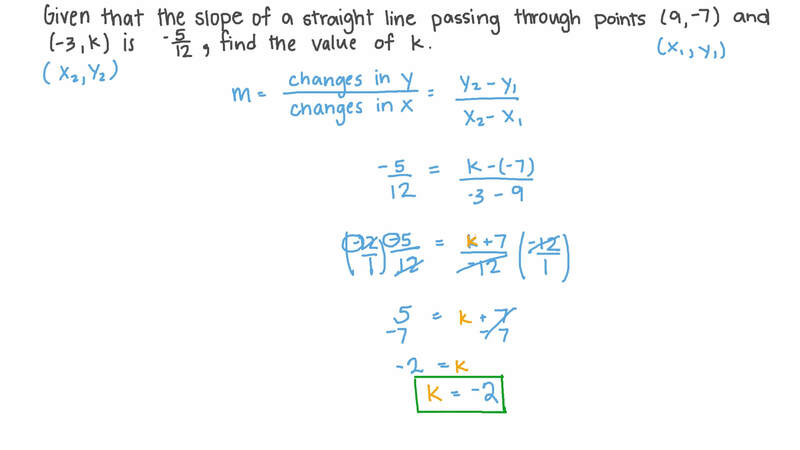 Determine the slope of the line that passes through the points 𝐴 ( 2 , − 5 ) and 𝐵 ( 4 , 5 ) . What is the value of 𝑦 so that 𝐴 ( − 9 , 6 ) , 𝐵 ( 3 , − 3 ) , and 𝐶 ( − 1 , 𝑦 ) are collinear? Given that ( 9 , 1 ) and ( − 8 , 𝑚 ) are the direction vectors of two perpendicular straight lines, determine the value of 𝑚 . In the square 𝐴 𝐵 𝐶 𝐷 with 𝐴 ( − 2 , 3 ) and 𝐵 ( − 8 , 9 ) , the diagonals are 𝐴 𝐶 and 𝐵 𝐷 . What is the slope of ⃖     ⃗ 𝐵 𝐷 ? Determine the slope of the straight line that makes an angle whose cosine is − 3 4 with the positive 𝑥 -axis. In the figure below, find the slope of the line 𝐿 , and round the result to the nearest hundredth. If 𝐴 𝐵 𝐶 𝐷 is a parallelogram, where 𝐴 ( 8 , 2 ) and 𝐵 ( − 4 , 7 ) , find the slope of ⃖     ⃗ 𝐷 𝐶 . Given that △ 𝐴 𝐵 𝐶 is right angled at 𝐵 and that the coordinates of 𝐴 and 𝐵 are ( − 3 , − 8 ) and ( 3 , 0 ) , respectively, determine the slope of ⃖     ⃗ 𝐵 𝐶 . Find the slope of the straight line whose equation is 6 𝑦 = 𝑎 𝑥 + 9 and passes through the point 𝐴 ( 7 , − 2 ) . In this figure, the slope of ⃖     ⃗ 𝐴 𝐵 is . Given that the slope of the line passing through ( − 2 , 7 ) , ( 𝑥 , 3 ) , and ( 5 , 𝑦 ) is − 1 , find the values of 𝑥 and 𝑦 . Find the slope of the given straight line. 𝐿 𝑀 𝑁 is a right-angled triangle at 𝐿 where 𝑚 ∠ 𝑀 = 4 5 ∘ and the coordinates of 𝐿 and 𝑀 are 𝐿 ( 7 , − 4 ) and 𝑀 ( − 3 , − 4 ) respectively. Find the coordinates of 𝑁 given the slope of 𝑀 𝑁 is 1. Use the graph to answer the following questions. Determine the lengths of 𝐹 𝐺 , 𝐺 𝐻 , 𝐶 𝐷 , and 𝐷 𝐸 . What is the ratio of 𝐺 𝐻 𝐹 𝐺 ? What do you notice about the ratios 𝐺 𝐻 𝐹 𝐺 and 𝐷 𝐸 𝐶 𝐷 ? What do the ratios 𝐺 𝐻 𝐹 𝐺 and 𝐷 𝐸 𝐶 𝐷 represent? Which line has a slope that is greater than 1? What is the gradient of a line passing through the points and ? 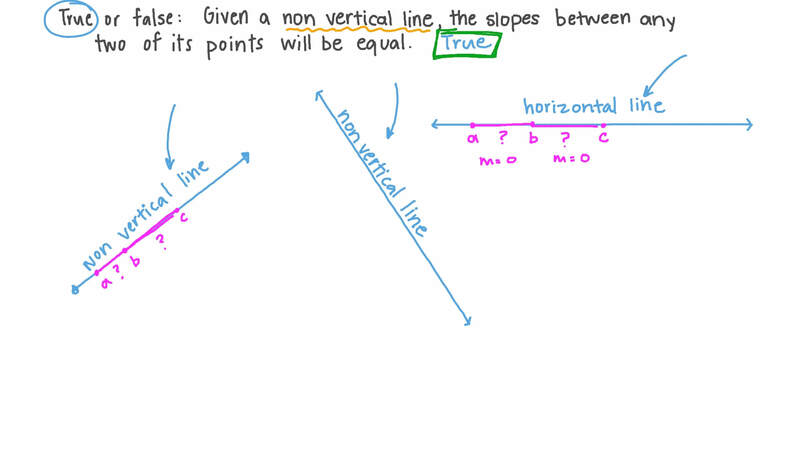 True or False: Given a non vertical line, the slopes between any two of its points will be equal. Which of the following characteristics does the line that passes through the points ( − 7 , − 6 . 7 5 ) , ( 3 , − 1 4 . 2 5 ) , and ( − 2 , − 1 0 . 5 ) have? What is the value of 𝑥 in the graph if the slope is equal to 0.7? Give your answer correct to two decimal places. A straight line has the equation 𝑦 = 4 𝑥 − 5 . What is the slope of the line? Given that a linear function contains the points (2,3) and (0,6), find the slope of the function and state whether it is increasing or decreasing. Given that the slope of a straight line passing through the points ( 9 , − 7 ) and ( − 3 , 𝑘 ) is − 5 1 2 , find the value of 𝑘 .